In this week's Thinking Outside The Pod; Jimmy, Jason, and Jessica begin by discussing a recent local story about instant justice. They also they give their opinions about the upcoming and past Spider-man movies, the choice Marvel made for the new director for the Han Solo movie, and everything in between. Enjoy! 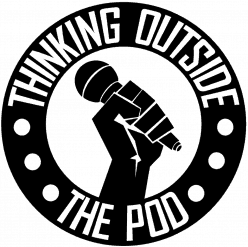 Also, thinkingoutsidethepod.com is working again, so check it out to find past episodes, contact and social media information, or anything else you need! In this week's edition of Thinking Outside The Pod, Jimmy, Jason and Jessica discuss what would be some of the hardest things in life to give up, what are some of the products from their past they would bring back, and they give their opinions on Wonder Woman. Tangents include: Storytelling, Pop-tarts, All-in-one Liquids, Bill Cosby, Writing a new workplace comedy, Boy Meets World, Strippers, and everything in between. Enjoy!